Applying to an accredited restaurant management degree program is an outstanding way to work towards higher career earning power while learning how to enjoy fabulous foods in the comfort of your own restaurant. Dining out is truly one of life’s greatest pleasures, and you can create the same atmosphere in your home kitchen as well. Restaurant management programs include detailed courses about the successful habits of a profitable enterprise, and many students gain hands-on experience that can translate into a rewarding career. Restaurant managers are responsible for the overall quality of food and the high level of service that customers receive at any particular establishment. The professionals also set the tone in a dining room and often work with interior designers to enhance the decor and create a total effect that invites guests in for their meal. While in restaurant management degree programs, students have a chance to learn the fundamentals behind successful operations, and they spend time in classes that show how to create a profitable enterprise with a warm and welcoming atmosphere. Instructors may highlight the choice of serving dishes and the use of flowers, colours, and lighting that can create a relaxing ambiance. Since setting and presentation are crucial components of the way that meals are perceived, managers can learn how to decorate, so they can easily enhance the unique mood that a thriving restaurant offers to its clients. Creating a successful restaurant or an efficient kitchen at home is another skill that students will have an opportunity to learn while studying at restaurant management degree programs. Instructors offer valuable information about scheduling and preparing meals to make sure that customers receive outstanding fare that is also visually appealing. Because a manager is responsible for overseeing the cooks, servers, and staff in a restaurant, they must be able to plan the most efficient way to create schedules, prepare meals and serve guests. Some graduates of a degree program are also highly involved in menu creation, and they may work directly with an executive chef to plan appetizers, entrees, and desserts that work best together. All of these skills are useful at home and at work, and they make taking courses an outstanding option for anyone who enjoys asking friends and family members over for dinner. After graduating from restaurant management school, students also have the potential to turn their skills into a rewarding salary. The field offers plenty of opportunities, and many managers work in restaurants for hotels, resorts, or casinos. 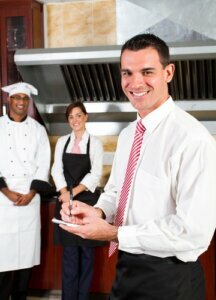 The working conditions may be fast paced, but a restaurant manager can receive outstanding rewards for their efforts. Salaries vary depending on the particular geographic area where a professional works and their years in the industry. Entry-level managers can expect to earn in the neighbourhood of $35,000, and those who are in exclusive positions can easily bring home six figures each year. Many of today’s luxury hotels are expected to offer a full suite of services across a variety of in-house restaurants, and the hospitality industry is expected to experience growing demand over the next decade. This factor should help to drive salaries higher and create more opportunities for qualified candidates. Some managers oversee the daily operations of the entire facility, and they play an integral role in a hotel and restaurant’s success. Applying to restaurant management degree programs gives anyone a chance to enjoy hotel-style cuisine at home while having access to the excellent salaries and plentiful career opportunities that the industry offers. Zac Parker is a very creative writer who focuses on career oriented writings and brings great information to his readers. With his successful tenure in career as a professional writer, he also enjoys guiding others so that individuals can make a bright future in restaurant management industry.